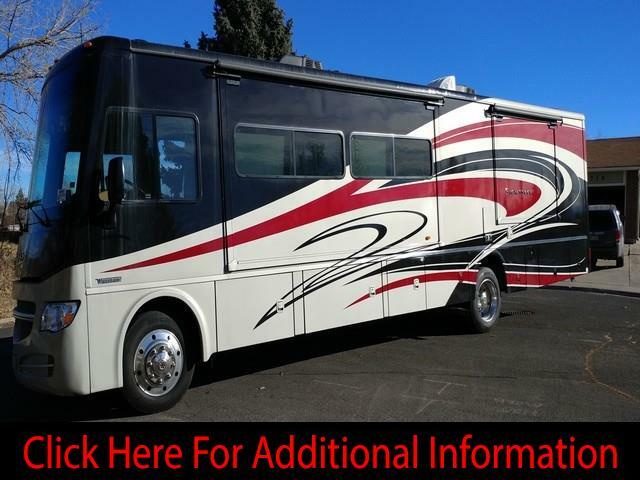 2015 Winnebago Sightseer 36Z-Class A Gas, Ford F53 Chassis with 362-hp 6.8L Triton V10 SEFI Engine, TorqShift™ 5-Speed Automatic Transmission, Only 7,244 miles, 2nd Owner. 3-Slides. Non-Smoking & No Pets! Upgrades Include: Winegard Mission automatic satellite TV antenna system, Home Theater Sound System amplifier, DVD player, receiver, speakers, and subwoofer, Vinyl floor covering throughout (cab area and slide outs carpeted), Powered (Studio-Loft) drop-down loft bed, Passenger seat w/footrest, 3-burner range w/cover and oven, Outside Entertainment Center 32" HDTV w/adjustable bracket, AM/FM stereo, CD/DVD, remote, 2 speakers, Owner has added: Safe-T-Plus Steering Control (For Severe Side Winds, Pot Holes, Shock From Front, Tire Blowouts, Pavement Drops, Road Ruts and Bumps, Passing Tractor-Trailers), & a Road-Master Anti-Sway Rear Stabilizer Bar (For Better Cornering, Stability & Tracking). Standard Features: Ultra-leather swivel cab seats, MCD solar/blackout roller shades, Corian countertops with decorative backsplash, Powered Hydraulic Leveling jacks with 3-position controls, Powered patio awning with LED lighting and metal wrap, Powered entrance awning w/LED lighting, Electric fireplace, Full-body paint with high-luster clear coat finish, six-way power Ultra-leather driver seat, dash workstation, One Piece Fiberglass roof, Radio/Rearview Monitor System 6" LCD color touch screen, remote, iPod/MP3 input, rear color camera, Power mirrors w/defrost and sideview cameras, Solar shades and privacy curtains for driver and passenger windows, Tinted-dual-glazed thermo-insulated windows, 40,000 BTU ducted furnace, 5,500-watt Cummins Onan Marquis Gold gas generator (15 Hours), 50-amp. power cord, Automatic generator start system, 4 deep-cycle, Group 31 Marine/RV batteries, 2,000-watt inverter/charger, Heated holding tank compartment, 10-gallon 110-volt/LP water heater w/motoraid/ auto heater, Holding tank flushing system (black tank only), Stylized aluminum wheels. Textured glass shower door & Porcelain toilet w/foot pedal and sprayer, 32" HDTV Bedroom TV, King bed w/innerspring mattress and storage below. Additional Features: Large-capacity 2-door refrigerator/freezer w/icemaker water filter, Sirius-XM receiver (subscription not included), remote, iPod interface connector, dome LED lights, 7-pin trailer wiring, Trailer Hitch 5,000-lb. drawbar/500-lb. maximum vertical tongue weight. Exterior Length-37’6”, Exterior Height-12’4”, Fuel-80 Gal., Freashwater-83 Gal., Gray-47 Gal., Black-44 Gal., LPG 18 Gal. Please No Trade Offers, No Broker or Marketing Calls! SMS Text Messages will not be answered-too many scammers! Showings are by Appointment ONLY for Qualified Buyers! Please Call 72066030sixtwo. Additional info at nextstepprosales(dot)com (Marketing Company for Private Sellers-This is a Private Sale). Youtube Video: youtu.be/L5iKQQ1K6BE Looking for Financing-Contact Dana Zimmerman at Credit Union of Denver 303-239-118four. Message: Thought you might be interested in this 2015 Winnebago Sightseer.